Hot on the heels of NBC’s live televised remake of Fail-Safe comes this two part Showtime adaptation of Nevil Shute’s post-apocalyptic classic On the Beach. (Let’s hope this mini-boom in Cold War-era retreads ends before we get Robin Williams playing multiple roles in a remake of Dr. Strangelove.) Updated to the year 2006, after a Chinese invasion of Taiwan has sparked a nuclear war, this version of On the Beach is remarkable only for how unremarkable it renders the prospect of worldwide annihilation. 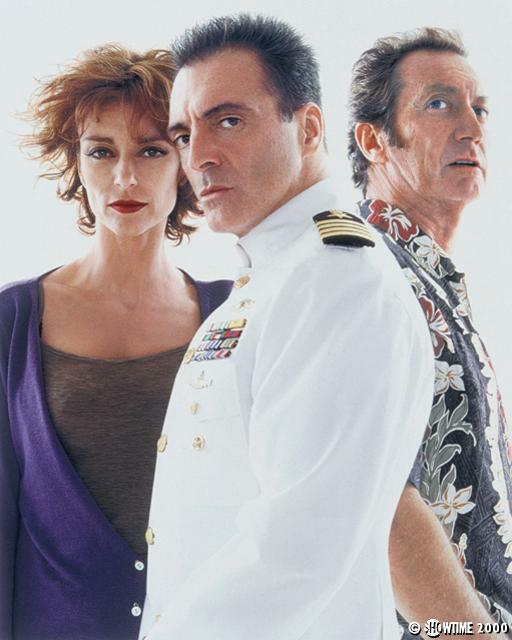 Armand Assante (The Mambo Kings, Hoffa) is American sub commander Dwight Towers, who finds himself a man without a country after nukes wipe the U.S.A. off the map. He and his Navy crew make for Melbourne, Australia, one of the last remaining pockets of civilization. Melbourne itself is threatened by an encroaching radioactive cloud, so Towers agrees to undertake a mission to the frozen north of Alaska, which scientists theorize may have come through the global catastrophe unscathed. But one of their ranks – cynical Julian Osborne (Bryan Browne) – disagrees. Osborne is trying to make up with his ex, Moira (Rachel Ward), before the end arrives, but Moira’s eyes are only for Dwight. The ensuing love triangle consumes much of the first installment of On the Beach, with the end of the world relegated to backdrop status. In fact, no one really seems to notice or care that most of the human race has been rendered extinct, which makes for a sluggish, uninvolving apocalypse indeed. The dramatic justification for this blase treatment is evidently that the characters are in denial, but this leaves little of interest beyond the usual soap opera treatment of human relationships. This proves to be a major problem because, quite frankly, these are not the people most of us would want to spend the end of the world with. Assante’s Dwight Towers is a quintessentially square-jawed, hard-assed career military man who reveals occasional flashes of emotional depth (he’s lost his family in the nuclear holocaust). He’s certainly preferable to Julian – played by Bryan Brown as a whining twit – or Moira, a self-satisfied cipher in the hands of Rachel Ward. The romantic entanglement of these characters is a no-win situation: we’re supposed to be rooting for Dwight and Moira to get together, when it truth it’s Julian and Moira who deserve each other. It’s a relief when the second half begins and the romance takes a back seat to submarine adventure. Dwight and his crew head north, and at first the results are encouraging. Sonar buoys reveal that the level of radiation is dropping, and a garbled transmission intercepted from Anchorage indicates that life does go on. But once all hopes are finally dashed, the crew must make a decision whether to return to Melbourne as ordered, or to finish out their days in the ruins of San Francisco (where many members of the USS Charleston crew hail from). At this point – over two-thirds of the way through the miniseries – the weight of the cataclysmic events finally emerges and the story picks up considerably. Unfortunately, it’s a case of too little, too late. Director Russell Mulcahy (Highlander) lends an eerie atmosphere to several scenes: one in which Dwight and his second-in-command take a walk through the deserted, snow-dusted streets of Anchorage is particularly effective. But too often he ignores the opportunities afforded by the material, bypassing a sense of impending doom in favor of the dramatic tension of a poker game or the cheap thrills of a helicopter ride. The recent independent film Last Night, which also features characters reacting matter-of-factly to the end of the world, nonetheless managed to convey a convincing doomsday atmosphere on a limited budget. Such moments are fleeting here, shunted aside for turgid melodrama. By the time one character decides to stay behind in irradiated San Francisco and do some fishing, it’s almost as if he’s got the right idea.